The Cuisinart CIL4525-26R lightweight non-stick cast iron cookware is ideal for deep-fry, stew, or to braise any meal. The cookware features classic cast iron construction for even heating and best heat retention. Its porcelain enamel exterior and Dupont® Platinum non-stick coating offers durability creating an ideal cooking surface that does not impart flavors or absorb odour. The cookware is designed to be up to 50% lighter than traditional cast iron cookwares. The cookware's riveted stainless-steel handle stays cool on the stovetop, while its lid seals in moisture and nutrients for healthier, more flavorful results. It is induction ready and dishwasher safe. The 5.25Qt Dutch Over W/Cover Red Castlite Non-Stick Cast Iron has many exciting features for users of all types. You can extend the lifetime of your 5.25Qt Dutch Over W/Cover Red Castlite Non-Stick Cast Iron with the purchase of a FactoryOutletStore Factory Protection Plan. See the 5.25Qt Dutch Over W/Cover Red Castlite Non-Stick Cast Iron gallery images above for more product views. 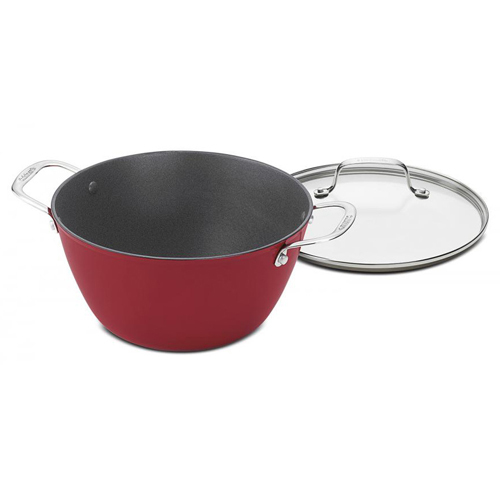 The 5.25Qt Dutch Over W/Cover Red Castlite Non-Stick Cast Iron is sold as a Brand New Unopened Item.